The morning heat settled instantly on my skin upon stepping off my Turkish Airlines flight into Nepal. I breezed through the visa process since I was towards the front of the line, and quickly found my ride outside. Once the rest of our group arrived and we made the short drive to central Kathmandu, the van was surrounded with a whir of activity. Store owners setting up shop, people making their way to work, kids headed off to school, and buses, vans, and motorcycles criss-crossing in the streets without, it seemed, any rules of the road. I gripped the armrest tighter as I bounced along in my seat through the bumpy, traffic-ridden streets. Motorcycles weaved in and out of traffic and zoomed down side streets right alongside shops and stores. I was cautious and on high-alert walking through the dusty streets that first day, as I went out into the city to explore. In return, I was welcomed with vivid colors and smiling Nepalese faces. Though my time spent in Kathmandu was too short, I still managed to see some of the highlights. 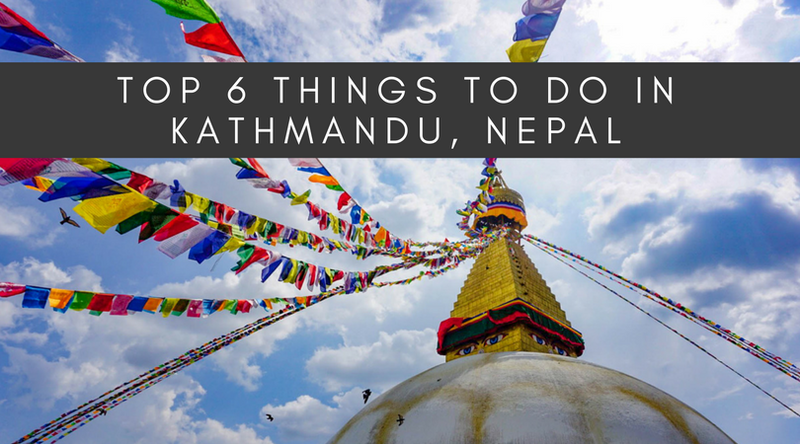 These top six things to do in Kathmandu, Nepal should be first on your to-do list. In the center of Kathmandu you’ll find Durbar Square (also known as Hanuman Dhoka Durbar Square), originally constructed from the courtyards and palaces of the old Malla kings and Shah kings between the 12th and 18th centuries and was eventually designated a UNESCO World Heritage Site in 1979. It is one of three Durbar Squares within the Kathmandu Valley, as the general meaning of Durbar Square is a place of palaces. While the square is free for locals to enter, tourists need to pay the 1000 rupee entrance fee. Throughout Kathmandu Durbar Square you’ll find a cultural goldmine of temples, palaces, and courtyards with intricate architecture and design, as well as street vendors and plenty of pigeons. One of the central sites is the Hanuman Dhoka Palace itself, where Nepal’s royalty resided until the 1800s. The Taleju Temple is another main attraction here and is the tallest structure built by king Mahendra Malla. The Kasthamandap (wooden house) is the building after which the city of Kathmandu was named. Don’t miss the Maju Deval, a temple dedicated to Shiva built in 1690 by Queen Mother Riddhi Laxmi, and Kal Bhairav, one of the largest stone idols of Bhairav which is Shiva in his most ferocious form. The Kumari Temple (also known as Kumari Bahal, Kumari Ghar, or Kumari Chowk) is another must-see. This three-story, brick structure is home to Kumari Deli, the living goddess. She is a young girl who is specially chosen and is believed to be the human incarnation of the Hindu goddess Durga (who is also known by many other names). If you’re lucky you may catch a glimpse of her through the window, but put your cameras away as it is forbidden to take any photos of her and is considered to be a bad omen. Kathmandu Durbar Square is a nice area to walk around and observe the sites, but you may also want to try a guided tour to know more about what you’re looking at and learn more about the square. This Durbar Square tour visits all three Durbar Squares in the Kathmandu Valley. Just north of Durbar Square is Thamel, one of the most popular tourist neighborhoods in Kathmandu. The narrow streets are lined with souvenir and trekking shops, clothing stores, hotels, restaurants, and more. Don’t bother taking a taxi around this area as it will be much faster for you to walk. Despite being touristy, I still loved Thamel and its energy both day and night. Common items you can take home include Nepalese tea, incense, handmade rice paper journals, sculptures, cheap trekking gear, locally made jewelry and scarves, prayer flags, spices, puppets, and Nepalese handicrafts like prayer wheels, traditional masks, pottery, and singing bowls. Remember to bargain especially in Thamel where prices will be higher since it is a tourist district. You’ll typically be charged about two thirds higher than the actual price as a tourist. It also helps if you keep smaller bills on you, I recommend having plenty of 100 Nepalese rupee bills handy when shopping. This Buddhist stupa (a mound or dome-shaped structure used as a Buddhist shrine and place of meditation) is commonly known as “Monkey Temple” due to the abundance of monkeys on site. They even have a special swimming pool just for the monkeys. Though they may look cute and friendly, watch out for these sneaky monkeys as they are known for pick pocketing and stealing food. The monkeys are cute but sneaky! Perched upon a hill overlooking Kathmandu valley, Swayambhunath Stupa is a great place for panoramic views of the city. It is one of the oldest and most sacred religious sites in Nepal. The stupa itself is covered in gold with Buddha’s watchful eyes painted on all four sides, a symbol for him watching from all directions. The dot above each pair of eyes is the third eye, signifying the wisdom of looking within, or as our guide explained it, being “aware of your own actions before you can judge other people.” Instead of a nose between the eyes, you’ll notice a squiggly symbol that is the number one in the Nepali alphabet, to show unity and that the Buddhist path is the single way to enlightenment. Both Buddhists and Hindus regularly visit the important pilgrimage site of Swayambhunath to worship and leave offerings. Joined together, the religious harmony I observed here was a sign of unity throughout Nepal. Seated along the banks of the Bagmati river, Pashupatinath Temple is dedicated to Lord Shiva and is the most important Hindu temple in Nepal. Although non-Hindus are not allowed inside the main temple, it’s still worth a walk around the buildings and river. It is likely you will have the opportunity to observe an open air cremation taking place, as many elderly Hindus come here to spend the final few weeks of their lives and then be cremated along the banks of the sacred river Bagmati. Those who die here are believed to be reborn as humans. You will also notice the colorful, painted men at Pashupatinath known as Sadhus (Hindu holy men) who charge money for tourists taking photos of or with them. As the largest stupa in Kathmandu and one of the largest in South Asia, the Boudhanath stupa is 36 meters high and is the center of Tibetan Buddhism in Nepal. The stupa was historically a sacred site on the ancient trade route to Tibet where Tibetan merchants and traders would rest and pray for a safe journey through the Himalayas. It has remained an important place of pilgrimage and meditation both for local Nepalis and Tibetan Buddhists since 1959 when thousands of Tibetans arrived in Nepal after the Chinese invasion. The stupa itself is likely to contain holy relics, such as sacred texts and objects used or touched by Buddha or possibly even parts of his body. Stupas are sealed so no one knows for sure what is inside, but its contents are believed to hold the power for the stupa. Colorful prayer flags are draped down from its spire and flutter peacefully in the wind. Each color represents a different element – air, fire, water, wind, and earth. They are hung up high so the prayers are carried by the wind up to the heavens. When they blow downwards, it is believed the gods are sending down their blessings from the heavens. Remember to walk around the stupa in a clockwise direction to observe Tibetan custom. Visit all three of the above — Swayambhunath Stupa, Pashupatinath Temple, and Bouddhanath Stupa — plus Kathmandu Durbar Square in this Kathmandu full day tour. Have a traditional, organic dinner at Bhojan Griha in a restored 19th-century mansion. Since dancing and folk music are embedded in Nepalese culture, there are live cultural dances and local songs every night during dinner at Bhojan Griha. The seating is traditional on cushions on the floor, but the seats still have backs on them so you don’t have to worry as much about your knees and back. The meal includes a standard spread of authentic Nepalese food, so let them know if you would like the vegetarian option instead. The main course is a mix of steamed white rice, fried fish, chicken curry, lentils, and vegetables. You’ll also be supplied with plenty of aila throughout the meal, a locally brewed (and very strong) rice wine. Additionally, the restaurant is committed to social and environmental responsibility. From the start, the six-year long renovation was completed by locals, and all the current staff are also locals. They don’t use any plastic in the restaurant, and the tableware, fabrics, and décor are handcrafted. Owned by Mr. Bharat Basnet, the same founder of Bhojan Griha, Kantipur Temple House is an eco-boutique hotel centrally located in Kathmandu in the neighborhood of Thamel and is only a 10-minute walk from Durbar Square. Once you walk through the garden and across the terrace, the first thing you’ll notice is the authentic Nepalese architecture and décor of the building and rooms. They operate under a “no plastic philosophy” and clean drinking water is provided for guests in all rooms. The showers are provided courtesy of solar heated water and they avoid changing towels or bed sheets daily (unless requested) to save water. They also create jobs by hiring locals in the community. Though there are frequent power outages in Nepal, Kantipur Temple House was one of the first hotels in Nepal to use completely clean energy for their daily operations, and they use solar power instead of traditional diesel generators. The WiFi here was the best I had during my entire time I spent in Nepal, as they have multiple networks you can join if one is slower. This also happened to be the only place I stayed that didn’t have air conditioning, but they do provide fans and I actually barely even used the fan. Many of the rooms open up to the courtyard so the sun is never directly beating in the window, and it seemed to stay fairly cool in the rooms. There are also free daily yoga classes out on the lawn for a fresh start to your morning. Rates start at only $63/night on Booking.com! For a higher end option on the outskirts of town, try the luxurious Park Village Resort. Relax at their outdoor swimming pool with mountain views peeking out in the backdrop or enjoy the peace and quiet of their wooded gardens. They have both standard rooms and apartment options to suit your party size and trip needs. There are multiple restaurants on site as well as a classy bar and lounge in the lobby area. Take your pick from these Kathmandu day trips and extended tours to find activities and sights that suit your interests. These things to do in Kathmandu really only scratch the surface. There is so much more to see in the city, so let me know in the comments below what you would add to this list! I began and ended my trip in Kathmandu. During the last few days of my trip, it was as if a film had been lifted from my eyes. The chaos transformed into a vibrant energy that pulsated through the city day and night. Hard working shop owners were selling their vegetables, souvenirs, clothing, and more from dawn until late into the night. Backpackers and travelers browsed the streets, bargaining with local vendors and soaking in the new sights all around them. Locals moved to and from their day-to-day business. As I stared out the window at my final glimpses of Nepal on the way to the airport, I leaned back and relaxed in my seat, enjoying every last bump in the road, weaving motorcycle, and honking horn. I will return for you, Nepal. Want to hear more about Nepal? There are plenty more posts on the way! Sign up here to be notified of my latest updates via email. Great round up of things to do in Kathmandu! I did all these (except for the restaurant) the first time I went to Nepal in 2014. Totally worth it to visit. Katmandu seems like such a spiritual place … can’t wait to visit someday! It truly is, in so many different ways! I hope you have the chance to visit soon! I wish I had planned to arrive in Kathmandu a few days before my trek. I was just so exhausted after five days of trekking that I never really had the chance to explore Kathmandu after. I especially had wanted to make it to the Monkey Temple, but it will have to wait until my next trip to Nepal. Because I will definitely be back! Oh, how I love Nepal! I spent about 3 days there last year, probably not even that, but it was enough for the city to take a piece of my heart. The chaotic vibe of the city is definitely something you get used to isn’t it and eventually it’s another thing that just adds to the exciting atmosphere of one of the most interesting places on earth! It sounds like you had an awesome time there! Yes you do start to get used to it after a while, and I loved it! I hope you have the chance to return soon, Emma! Thanks for the article. It helps a lot to plan a trip to Nepal. Especially for those who are visiting Nepal for the first time. Did you trek any routes during your visit to Nepal? If not here are the list of trekking routes in Nepal.